Within a memo sent to authorized purchasers earlier today, the United States Mint revealed some details about the release of the 2011 America the Beautiful Silver Bullion Coins. These coins contain five ounces of .999 fine silver, have a diameter of 3 inches, and carry the same designs as the circulating America the Beautiful Quarters. The releases of the series for 2011 will feature Gettysburg National Military Park, Glacier National Park, Olympic National Park, Vicksburg National Military Park, and Chickasaw National Recreation Area. 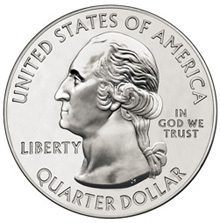 The obverse of each coin carries a portrait of George Washington. Under the authorizing legislation for the program, the US Mint is required to distribute the coins through their network of authorized purchasers (AP’s). These eleven primary distributors are able to purchase gold, silver, and/or platinum bullion coins directly from the Mint based on the market price of the metal plus a specified mark up. The coins are then resold to other bullion dealers, coin dealers, and the public. Due to the extremely low mintages for the 2010-dated America the Beautiful Silver Bullion Coins, the AP’s were required to agree to a set of terms and conditions to distribute the coins. This included a requirement to sell all coins directly to the public, impose an ordering limit of one per household, and limit premiums to 10% above acquisition cost. These terms were set by the Mint in response to complaints about unreasonable premiums charged by the distributors. According to the US Mint, the mintage levels for the 2011-dated releases will be “substantially higher” than the levels for the prior year. As such, there will be no terms and conditions imposed. However, in order to participate in this year’s release, AP’s must certify that they have sold all of their 2010-dated coins in compliance with the terms and conditions for those coins. At this time, there are several AP’s who have not fully distributed their 2010 coins. The US Mint indicated that the first 2011 design featuring Gettysburg National Military Park will be released in late April, although a specific on-sale date has not yet been determined. For the first year of the series, all five designs were released to authorized purchasers on the same date. Distribution of the 2011 ATB Silver Bullion Coins will take place on an allocated basis. The US Mint is also currently allocating supplies of the one once American Silver Eagle bullion coins. For the past three years, at times when the supply of bullion coins was insufficient to meet full public demand, available coins have been rationed at the authorized purchaser level. AP’s must certify. . . There’s a laugh. Coin N’ Things located in MA should be penalized for violating the Mint’s Terms and Conditions. They clearly bought the coin sets at $750 or less and sold them two days ago at a whopping $1100!!! This also included a mandatory “sales tax” even if you were living outside of MA! You basically were forced to buy their 90% silver products. The Mint needs to recognize this violation. Others have reported that they required the purchase of extra 90% silver coins to make the total order price $1,100 so it would not be subject to sales tax. I don’t know the sales tax collection rules in Mass, but if this was true, I’m sure most people would rather pay for extra silver than have the money go towards sales tax. in response to the first poster, wouldn’t it be illegal for them to now release the ‘uncirculated’ or ‘proof’ versions of the 2010 5oz ATB after 2010 is already over? I tried looking at the legislation on the US mint website, as well as a google search and can’t seem to find any hint now of a set other than the already released set. I have a hard time believing they produced them in 2010 and now can not determine a date to sell them. Seems to me more likely they were produced in 2011 and should have a “copy” stamped on them since they are a copy coin of the Bullion 2010 America the Beautiful coin. By law if a coin is not produced in same year as yesr designated on coin they have to have “copy” stamped on it otherwise it’s a counterfeit. Think they will break their own laws or deny produing them in 2011? Either way seems suspicious. There is a sales tax in every state. However, it’s only pertinent to buyers from within the state. Coins ‘N Things pushed MA state’s sales tax onto everyone (out of staters too) by forcing a purchase of 90% silver products. There was also no choice, it was forced. It was wrong. I think all coin collectors should boycott this place.